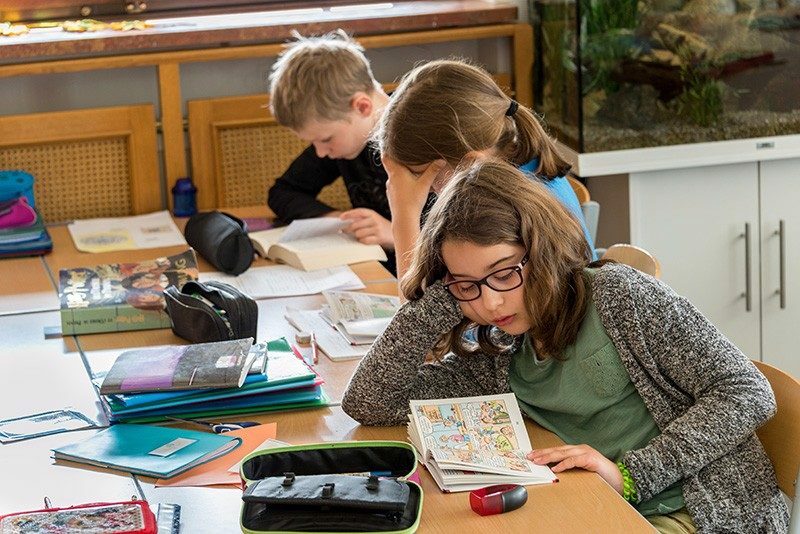 Children currently perfect their written language skills at primary school (calligraphy and grammar and spelling), improve their reading skills, broaden their knowledge of mathematical and botanic notions, develop their awareness of geography and history. They continue to add to their general knowledge and ask questions about the world and the way in which it works. 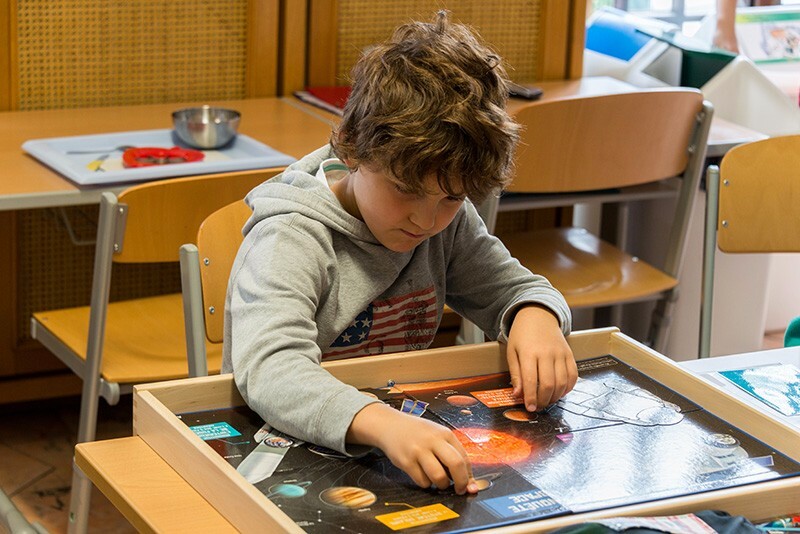 Through specific classroom experiences between the ages of 3 and 6, pupils comfortably deal with the notions addressed and understand them because they have “felt” them. But, like the class of pupils between the ages of 3 and 6, the pupils enjoy a freedom to do and learn whatever they want. They have the chance of developing at their own pace through work suited to their individual needs. 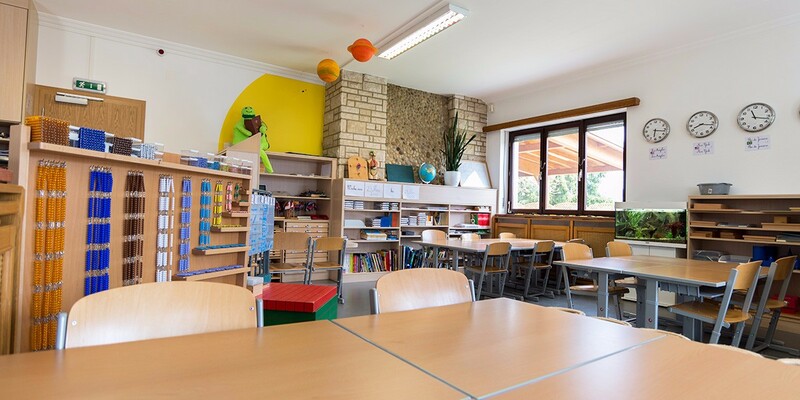 Therefore, there are no classes which dictate that a particular subject has to be studied at a specific time of the day involving all the pupils at the same time. The teacher nevertheless prepares an outline per level which enables the children to set milestones in relation to targets to be met. On this basis, each child can go along their own path to acquire new skills or add to the knowledge that they already have. Indeed, the aim is not to select what the pupils must be taught but rather to provide them with as expansive a choice as possible to satisfy their intellectual appetite. 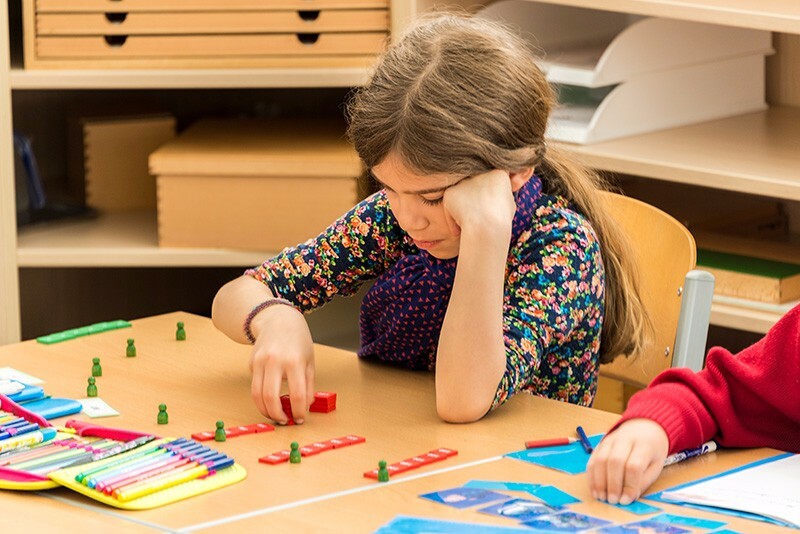 The whole teaching method intended by Maria Montessori and applied in our school promotes the right to equality for all and the absence of competition. Pupils work for themselves and not to get good grades. Thus, there are no marks, no class work, no reports and, last but not least, no homework! In the mornings, the children work in class on the principle of free choice. One French-speaking teacher and one German-speaking teacher supervise them every day and guide them in the process. 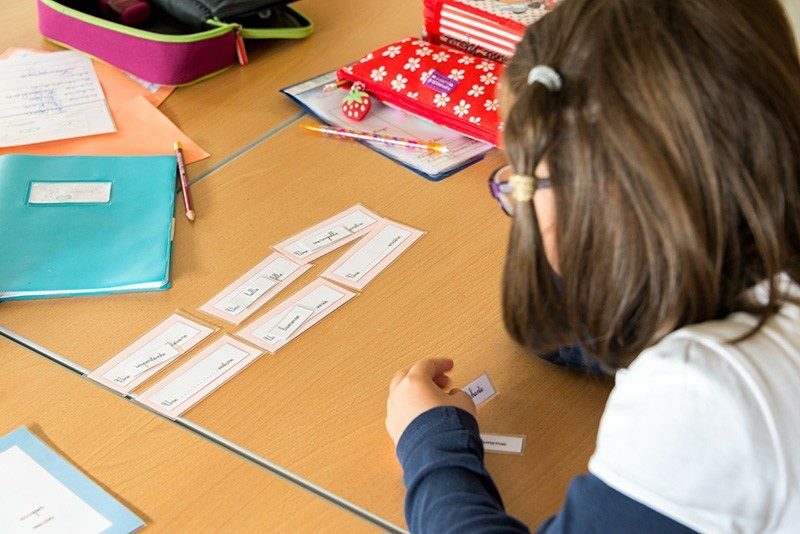 The principle of language immersion is the same as at nursery school: the learning processes are conducted in both languages at the same time. As for the afternoons on Monday, Wednesday and Friday, they are used to enable the pupils to explore their sporting, artistic or cultural talents. Whether understanding and observing the rules of the game, promoting team spirit, enjoying the challenge of bettering yourself, learning to be gracious in defeat, helping and respecting weaker pupils…sport is a vehicle for moral values which meet children’s needs at this age. Ball and team games, athletics, psycho-motor processes, swimming, etc. In these sporting workshops, the important thing is not about winning but rather learning how to control your actions and improving your own ability without trying to “beat” the rest. Based on the works of Arno Stern, the art workshop does not seek to instil an artistic technique but rather to allow pupils to experiment and find their own technique. Pupils aged between 6 and 12 are interested in the world they live in. By sometimes asking puzzling questions, this workshop encourages them to pursue their personal interests. Pupils can suggest cultural trips and go out and discover the world, or even remain in class and work on their project: whether through posters or research in books or on the internet, they satisfy their need for discovery by sifting through the details of their project in even greater detail. They can then choose to present their research to their classmates.